Being underinsured means having health insurance, but also high out-of-pocket medical expenses relative to income. In a study by The Commonwealth Fund, the underinsured were defined as those who report at least one of following: family out-of-pocket medical care expenses (not including premiums) that are 10 percent or more of income; among low-income adults (i.e., incomes below 200 percent of the federal poverty level), medical expenses that are 5 percent or more of income; or per-person deductibles that are 5 percent or more of income. 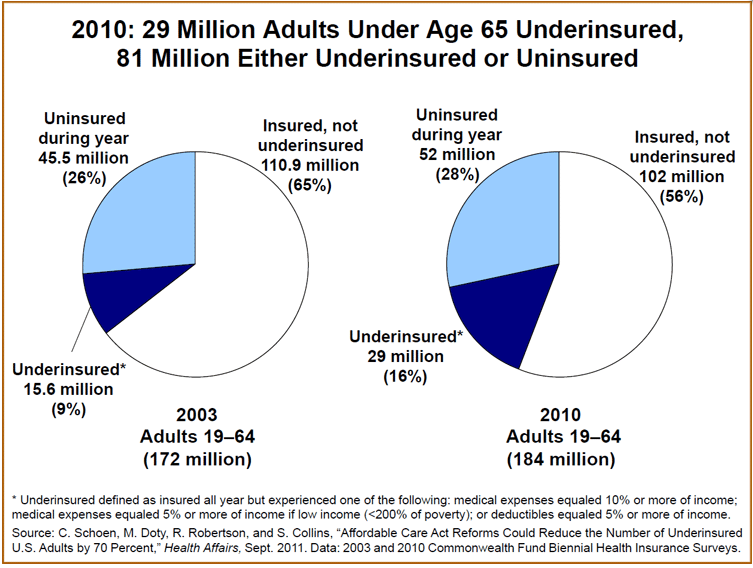 The number of underinsured adults rose by 80 percent between 2003 and 2010, from 16 million to 29 million. The consequences of being underinsured mimic those of the uninsured as increasing out-of-pocket costs result in fewer medical visits, delays in care, and improper use of medications (i.e., cutting pills in half, skipping prescribed doses or not filling prescriptions).